Kind words from some of my lovely brides…. Additional reviews under the “comments” section at the bottom of the page. Thanks so much, Tricia! I have honestly never had better make up. You are SO talented… it was such a pleasure! We actually ended up jumping in the pool at the end of the night and somehow my makeup stayed perfectly in tact!! I am so happy that I chose to work with Maravilla Make-up for my wedding day. Tricia was just a delight to talk to while getting my make-up done and she knew the exact look I was trying to capture. Victoria created a vision for my hair that was stunning in photos. My wedding was outdoors on the beach, and amazingly, my make-up and hair stayed perfectly in place for the entire 6 hours (even after the dance party). I highly recommend working with this fantastic team! Couldn’t have imagined a better day. Thank you for making me – and all the ladies – look fabulous! Thank you so much for leaving all of us ladies feeling our most beautiful on the big day, you did an amazing job!! Thanks for everything. My make-up looks fantastic in all the pics. They all have flawless make-up, even after the sweaty dancing! Pura vida! Thanks again for my fabulous make-up!! What an amazing day! My family continues to talk about how amazing everyone was and how everything turned out. You do an incredible job! Thank you so much for your amazing make-up assistance on my big day. It was amazing. We ended our wedding with the whole wedding party jumping in the pool. My make-up held up perfect after. Thank you, I received many compliments on my make-up. Thank you!! I couldn’t be any happier with my make-up and choice to go with you!!!! Coming from Chicago, I was very nervous to have my makeup done by people I did not know in Costa Rica, as I am very particular. Tricia was absolutely wonderful! I did a trial 4 days before my wedding. She took into account the ideas I had previously presented via emails and Pinterest photos. I wanted a natural, glowy, romantic look and she delivered! LISTEN to Tricia when she says the Bare Minerals and Urban Decay works best in the Costa Rican humidity. My makeup didn’t budge all day! She was on time and flexible with my ever-changing schedule. I was especially grateful that she was accommodating to my mother, who is wheelchair bound. She is professional, incredibly artistic, and adds a warm personal touch to her service! I could not have felt more comfortable or beautiful on my wedding day! Book Maravilla Make-Up! Thanks for everything, all of the girls were so happy with their make-up, and I received countless compliments all night (and now with photos after). I’d love to encourage other brides to use you guys. Can’t say thanks enough. Thank you so much!! I felt so pretty and amazing thanks to you and your talent. I have some amazing photos to prove that you worked some miracles on my face. And on our mothers and sisters. I am so happy with how everything turned out. Couldn’t have been more perfect. I wish I could look that good every day. You were the best. Thanks again. Thank you for everything, Tricia! I am so thankful for your AMAZING work. You are so incredibly talented and I wish you all the best! This review is long overdue. 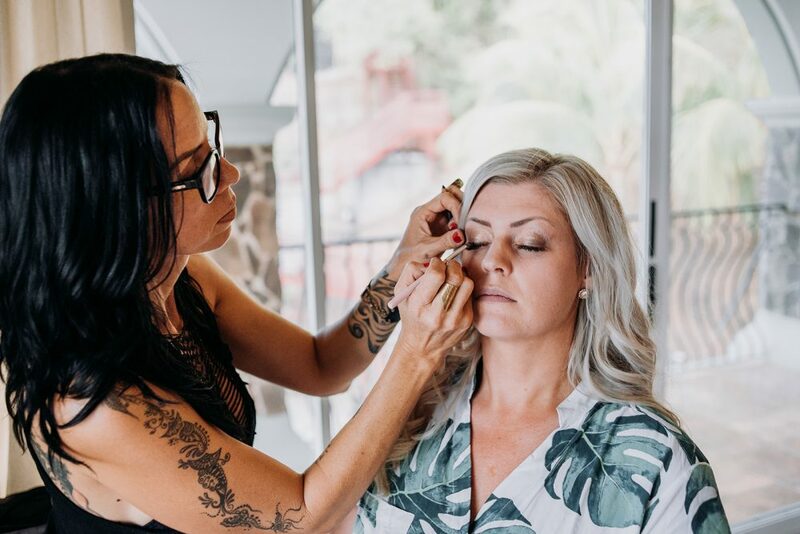 Tricia did my wedding makeup as well as the makeup for my bridesmaids back in April 2016, and we were all thrilled with how the makeup turned out. We did a trial a few days before the wedding to make sure she got down the look I was going for. I couldn’t be happier with my makeup on the day of – I looked natural both in person and in the photos, which is what I wanted. Tricia is so talented and a real pleasure to work with. I’m so glad she was part of our special day! Tricia, thank you for all the makeup for bridesmaids, moms, and myself. You were so fun and delightful to work with. You were very patient and listened to what each girl wanted. Everyone looked absolutely stunning!! All the girls were concerned about how I would find a hair and makeup person in Costa Rica that would be as good as we have in the US. But after having their makeup done by you, all they could do was sing praises!! They were super impressed, loved their makeup, and felt beautiful. The moms looked amazing and were so happy they had their makeup done. They even loved their lashes!! One of my biggest fears was my makeup and hair not turning out how I wanted on my wedding day, but you exceeded my expectations. I absolutely LOVED my makeup on my wedding day! I felt so comfortable and beautiful. Even by the end of the night our makeup was still flawless! You are the best. And I’m so glad I chose you to do our makeup and that you were part of our special day! Thank you again so much. Tricia — Thank you so much for our beautiful wedding makeup! My bridesmaids and mothers looked absolutely gorgeous. You were able to understand what we individually wanted and execute perfectly! Everyone was so happy, and our makeup ACTUALLY STAYED! It was the dead of summer and we were sure we would be reapplying, but we didn’t have to! Thank you again for your professionalism and talent!